Have you ever dreamed of eating honey that would taste of strawberry? What about raspberry, passion fruit or even cinnamon? We have dreamed of eating strawberry flavoured honey (who would not?) and we have made that dream come true. Welcome to HoneyBerry, the home of naturally flavoured honey. HoneyBerry is all about fusion and flavours. We produce the finest flavoured honeys with 100% natural ingredients. No artificial colourings or flavourings, no added sugar; just honey, fruits and spices. The real deal, just better. You would be guilty not to indulge. We are a family run business with over 30 years of experience in selling bee related products. 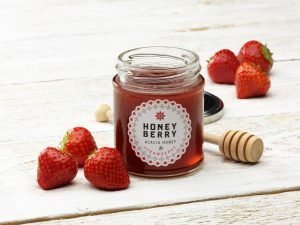 We have created HoneyBerry for honey lovers and non honey lovers as an alternative to jams and preserves and a substitute to sugar to sweeten beverages and favourite treats. HoneyBerry is available as pure Organic Raw Acacia Honey and in 5 different flavours: Honey & Strawberry, Honey & Raspberry, Honey & Organic Passion Fruit, Honey & Organic Cinnamon and Honey & Organic Chilli. We source the best fruits and spices from Europe, South America and Asia to offer you the best flavours and aromas. All our products are handmade in small batches with Organic Raw Acacia honey in a way that respects the properties and enzymes naturally found in honey. We put all our hearts in making the finest flavoured honeys.